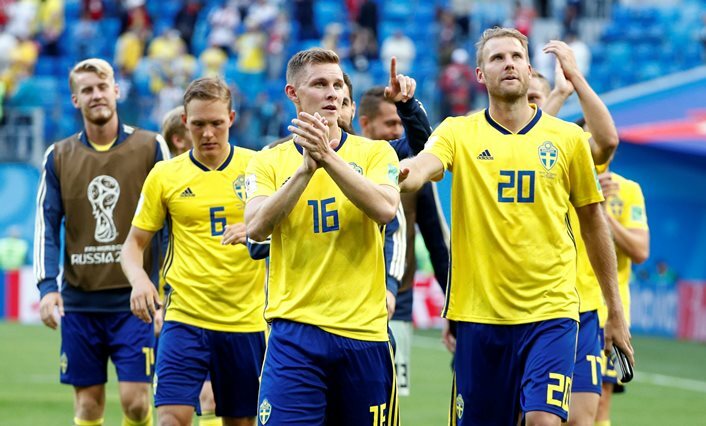 Analysis: Swedes steam into last eight with big names in their wake - SABC News - Breaking news, special reports, world, business, sport coverage of all South African current events. Africa's news leader. Sweden players celebrate after the match. Sweden’s brand of football may not be easy on the eye but on Tuesday they added Switzerland to a list already including the Netherlands, Italy and Germany as they marched into the World Cup quarterfinals. Had results in qualifying, the playoffs and the group stage gone another way, it might be any one of that illustrious trio preparing to face Colombia or England in the last eight on Saturday. Much as it might offend the purists, however, it is Janne Andersson’s no-name outfit who will make the trip to Samara after a typically rugged 1-0 victory over Switzerland in St Petersburg. The Dutch, third in Brazil four years ago, were barged out of the way in qualifying when Sweden edged the three-times World Cup finalists on goal difference to finish second in a group that France won. In the playoffs the Swedes were paired with four-times world champions Italy and sensationally saw them off over two legs to keep the Azzurri out of the World Cup for the first time since 1958. On seeding, defending champions Germany would have expected to be in Samara on Saturday but they finished bottom of Group F in Russia, an ignominious exit that would have come sooner had Sweden held out for a few seconds more to draw their clash in Sochi. And on Tuesday, Sweden proved that once again that dogged defending and huge collective effort can be very effective, even in the knockout stages of the World Cup. Sure, they were helped by the fact that Switzerland were toothless up front but no team is going to find it easy to break down the Swedes. Ranged across the pitch in a traditional 4-4-2 formation, they are happy to cede possession – Switzerland enjoyed 63 percent on Tuesday – confident that by working indefatigably for each other they would get it back. In attack, they lack the world-class edge that Zlatan Ibrahimovic once brought but they are big and strong and keep pumping balls into the box until one falls right for them. In St Petersburg, their goal came with an element of luck when Emil Forsberg’s shot from the edge of the area took a huge deflection off defender Manuel Akanji and spun into the net. The yellow-shirted hordes in the stands cheered it just as loudly as they once would an Ibrahimovic wonder-strike and, like the fans, Andersson does not really care what outsiders think about the way his team plays their football. “We know that we are a good team, we’ve earned our successes, we know how we’ve got this far,” he told a post-match news conference.